Approximately 370 dinghies can be berthed in the dinghy park (when boats are not in their berths the spaces can be used for car parking) and on the Quay, where there are designated spaces for larger dinghies and racks for Toppers. Duringthe winter months, normally October to April, the quay is cleared of dinghies and used for winter storage of cruisers, 26 feet and below. These are craned out onto the quay by our own well organised team to keep rates to a minimum. The club owns 21 moorings (drying) which it rents out to members at favourable rates. There is one visitor's mooring, close to the Quay and Clubhouse, which dries out approximately three hours either side of high water. 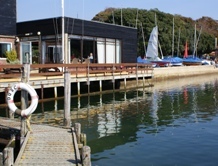 Black Shed Store : for masts and inflatable dinghies. 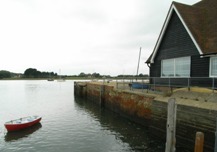 Ground Floor - a workshop suitable for repairs and painting of dinghies, masts, etc. The Quay : Offers convenient loading for cruisers and a secure berth if you are prepared to dry out. Provides convenient loading for cruisers as well as being a great place to secure your dinghy while visiting the clubhouse for refreshments. Please ask permission of the Duty Officer if you are just turning up, it's unlikely to be denied unless an event is scheduled and requires use of the pontoon. Drying out is permitted, but please let us know you are coming, there is an online form available for this purpose and it also describes the rules for visiting and drying out such as maximum boat length and stay. This pontoon is actually owned by the Chichecter Harbour Concervancy and the Harbour tours vessels may need access at certain time for the embarkation and disembarkation of passengers. Waiting is limited to ONE HOUR and drying out alongside is not allowed. Your boat will end up on firm and fairly level ground if you line up with the NE (inshore) corner of the quay wall with the pub sign and keep on going until you no longer see the windows of the starting box. There are three short chains set in the hard to make fast to, but you will need to attach warps and buoys to these at low water beforehand. The hard is firm right up to the quay, but beware of being neaped. Fuel : IS NOT AVAILABLE at Dell Quay. The nearest fuel is at Chichester Marina. Water : There are fresh water points on the Quay on the east corner of the club house and by the lifting barrier, but these are not close enough to any mooring place and you will need to transport it from tap to boat somehow.